Born Desiree Lucienne Conradi in Coulson, Surrey, 1 Jan 1917 to a Belgian father and English mother, Lucienne studied at Croydon School of Art and then continued her design education at the RCA in 1937. Lucienne did very well at the RCA and some of her graduate designs were bought by the V&A circulation department. She was offered a 4th year with full remission of fees, but she didn’t take it up. In 1942, she married Robin Day who she met at a RCA dance in 1940. During the war she worked for the dress trade a little and taught at Beckenham Art School and Bromley Country School for girls. In 1946, she helped to found the textiles group of the Society of Industrial Artists (now CSD). The same year, she created the ‘chintz’ design for Edinburgh Weavers that would launch her career. Although she was freelance and never had a contract, she ‘worked regularly’ for Heals from 1950, the result of a strong relationship with Managing Director Tom Worthington. As Design noted in April, 1959 Day was also unusually successful in working for the ‘German, American and Norwegian markets’. Lesley Jackson describes Day as ‘the most successful and sought after designer of the 1950s’. She rose to prominence during the Festival of Britain, 1951, when her wallpaper was on display in the Homes and Gardens pavilion. In 1952, her Calyx print design won the International Design Award of American Institute of Decorators. 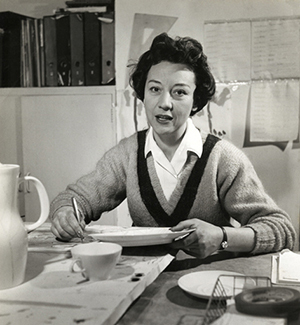 Lucienne Day became a well known figure in the public eye. In 1955, she and Robin were considered famous enough to feature in an advertising campaign for Smirnoff Vodka. From 1962-87, together they were employed as design consultants for John Lewis. In 1962, she was awarded an RDI in recognition of her contribution to British design and exports. She was the fifth woman to receive this recognition. In 2009 she and Robin both received Honorary Doctorates from the University of Brighton. 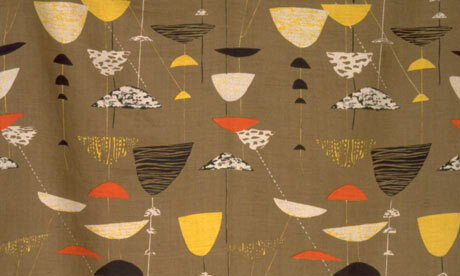 Lucienne Day died on the 30 January 2010. Archives of Lucienne and Robin Day are held at the V&A Art and Design Archives. Lesley Jackson, Robin and Lucienne Day: Pioneers of Contemporary Design, 2001. Jennifer Harris: Lucienne Day: A Career in Design, 1993. Fiona MacCarthy, Obituary: Lucienne Day, The Guardian, 3 Feb, 2010.